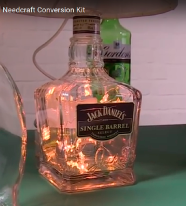 Convert your bottle into a lamp with this easy to use an adaptor. Just push the lamp holder into the bottle opening at the top, and then you can fit your lampshade. - For use with light bulbs up to 60W max. - Pushbar switch on BC lamp holder turns light on and off. - Ready fitted with 13A plug (and 3A fuse). - Approximately 2 metres of flexible cable included. - Fits bottles with a hole between 17mm to 19mm diameter. around objects and contour them inside bottles and glass jars. We can supply you with a lampshade making kit; they are available in many shapes and sizes to match your bottle.